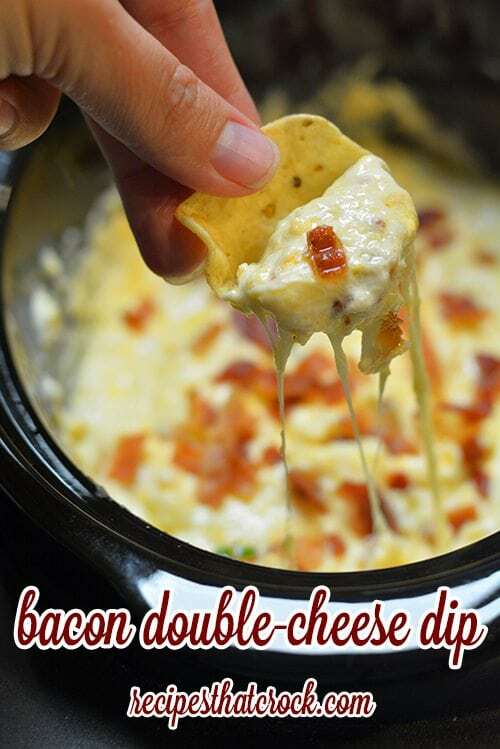 Bacon Double Cheese Dip - Recipes That Crock! Are you looking for a great party dip? This Bacon Double Cheese Dip recipe will tempt your guests to take a double dip! This Bacon Double Cheese Dip from Gooseberry Patch’s new Slow-Cooker Fall Favorites is the perfect party food. It is ooey gooey goodness that is totally scoopable with a great party chip. Also… Bacon. Enough said. I like to throw this decadent cheese dip in my 3 Pot Buffet Slow Cooker in the middle pot and serve two different meatballs in each side pot. Fantastic cheesy bacon dip from Gooseberry Patch's Slow Cooker Fall Favorites! Add remaining ingredients, reserving a little bacon to top with at the end. Cook on low for 3 hours or until hot and smooth. Here is Mikey’s Video Quickie of the recipe for those that don’t like long form video. This sounds amazing. It has all the creamy goodness in it. What’s not to like? Now I just need to buy the ingredients to make it. Thank you for a wonderful experience. OH.MY.GOODNESS this looks sooo tempting and wonderful!!! Thanks so very much for sharing with us at Weekend Potluck…and for linking back. Please come back and party with us again soon. Pinning! !